While more than a dozen athletes went through various drills at Ohio State’s pro day on Wednesday, there was no question what the event’s main attraction was. During most of the day’s events on the practice field at the Woody Hayes Athletic Center on Wednesday, some of the approximately 130 NFL team representatives in attendance watched intently while others held conversations with their colleagues, other athletes or members of Ohio State’s coaching staff. When Dwayne Haskins took the field for his throwing workout, however, the field cleared for Haskins and his receivers and everyone paid attention as the Ohio State quarterback got the chance to demonstrate once again that he has the passing ability to be a franchise quarterback for an NFL team. In the first portion of his throwing workout, Haskins completed 45 of his 50 passing attempts, and four of those five incompletions were dropped passes by his receivers. His completions included a multitude of perfectly placed deep balls, with his only true miss coming on an intermediate out route to the right sideline. Haskins finished his throwing session by completing 13-of-14 passes in the red zone. Completion percentages are supposed to be high at a pro day, where quarterbacks throw against air and don’t have to worry about getting hit, but his performance proved that he has the arm strength and accuracy to make any throw on the field – which is why he is destined to be Ohio State’s first quarterback selected in the first round since Art Schlichter in 1982. While Haskins didn’t have to worry about throwing over defensive backs or avoiding pass-rushers, he started his pro day workout with a drill that required him to move his feet through a rope ladder before throwing a pass, and was asked to maneuver out of the pocket before passing the ball on some of his downfield throws. Quarterback trainer Quincy Avery, who helped design Haskins’ workout, said they didn’t just want to show that Haskins could throw the ball accurately while standing still, but also that he could throw the ball accurately on the move. As well as Haskins performed on Wednesday, it was two of his receivers who caught passes from him that perhaps helped their NFL draft stocks the most at pro day. McLaurin had several highlight reel catches on the day, including one spinning and toe-tapping catch in the left rear corner of the end zone and several others that required him to leap or extend to make a play on the ball. A two-time Ohio State captain who is perhaps best known for being a selfless team player, McLaurin said he just wanted to help Haskins look good. McLaurin made himself look good on Wednesday, too, though – after already doing so at the Senior Bowl and by running a 4.35-second 40-yard dash at the combine – and now, he is apparently drawing consideration from at least one NFL team as a potential first-round draft pick, according to his agent Buddy Baker. Like McLaurin, Dixon also followed up a strong performance at the combine – where he ran a 4.41-second 40-yard dash – with an excellent pro day workout on Wednesday, as he consistently caught the ball cleanly away from his body and looked smooth running routes. “I ran good routes, I caught every ball I could, so I think I performed really well,” Dixon said. Campbell participated in a portion of Haskins’ throwing session, but bowed out of the workout early after falling down while running a route. He said after the workout that was experiencing some hamstring tightness and “tweaked it a little bit” when he fell down, but said his decision not to continue working out was precautionary. In addition to Campbell, Dixon, McLaurin and Weber, Ohio State also brought in two receivers from other schools to catch passes from Haskins: Cory Contini, an NFL draft hopeful from Ohio Dominican, and Jalen Robinette, who played at Air Force from 2013-16 and is now looking for his chance to play in the NFL after serving a two-year term in the Air Force. Contini and Robinette both went through a full workout for NFL scouts in addition to catching passes from Haskins. The only prospect from Ohio State who went through a full workout and ran the 40-yard dash on Wednesday was offensive lineman Malcolm Pridgeon. Ohio State did not release drill results from Wednesday’s event, but Pridgeon completed the 40 in an unofficial hand time of 5.45 seconds. Pridgeon also weighed in at 322 pounds, had an 8-foot-7 broad jump, did 22 repetitions of 225 pounds on the bench press and had a time of 4.67 seconds in the 20-yard shuttle. Michael Jordan and Isaiah Prince, who already went through the full spectrum of athletic testing at the combine, and Demetrius Knox, who was unable to go through a full workout due to a foot injury, joined Pridgeon to participate in offensive line drills. Dre’Mont Jones participated in defensive line drills and also participated in the 20-yard shuttle, but did not run the 40 after already participating in that event at the combine. Weber also participated in the 20-yard shuttle, 3-cone drill and broad jump after skipping those drills at the combine. Campbell, Dixon, Haskins and McLaurin each participated only in the throwing-and-catching session on Wednesday. Sean Nuernberger finished off the pro day by going through a kicking workout. He missed only three of approximately 20 field goal attempts on Wednesday, making his longest field goal from 54 yards out, while he also went through a series of kickoffs, hitting the ceiling of the practice facility on multiple attempts. In an impressive number for a kicker, Nuernberger also put up 20 repetitions of 225 pounds in the bench press. 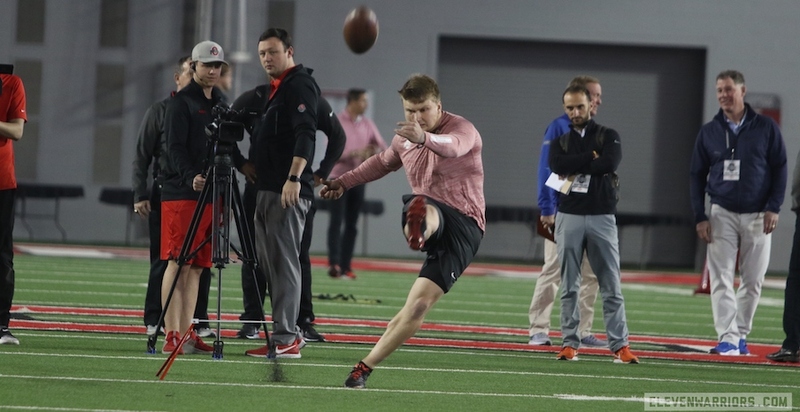 Sean Nuernberger finished off Ohio State's pro day on Thursday by going through a workout of field goals and kickoffs. Nick Bosa opted not to participate in any drills on Wednesday after already going through a full workout at the combine. Kendall Sheffield, who suffered a partially torn pectoral muscle while bench pressing at the combine, did not participate in any drills. Former Ohio State linebacker Dante Booker, who was not invited to the combine, also did not participate in any drills even though he was in attendance. All 32 NFL teams were represented at Ohio State’s pro day, with the Cleveland Browns sending 12 representatives to watch the event, most among all franchises. Notable NFL decision-makers in attendance included Cincinnati Bengals head coach Zac Taylor, Minnesota Vikings head coach Mike Zimmer and general manager Rick Spielman, New York Giants head coach Pat Shurmur, Washington Redskins head coach Jay Gruden, Buffalo Bills general manager Brandon Beane, Miami Dolphins general manager Chris Grier, Oakland Raiders general manager Mike Mayock and San Francisco 49ers general manager John Lynch.